About the size of a deck of cards, or say, one of those iPod things, it is a joy to hold, and to behold. Yes, the music is very beautiful coming out of the tiny speaker (I’ll have more to say about the music after a listen for a few days) but the thrill comes from the matching of the aural experience with the physical experience of the small device which seems to have come from some other time and place. There is no USB port. You can’t add or remove content. Instead the music stays locked in, incased and inseparable from the object that contains it. This is the part that floors me. I am currently in the process of managing, (organizing, editing, etc.) a massive, and growing larger, collection of digital files that comprise my music library. It is a tedious task that involves removing duplicate files, renaming and resorting files and folders, backing up some hard drives and reformatting others. Sometimes during this process I will see a song I haven’t heard in a while, give it a click to listen to it. Meanwhile the album artwork (if it is embedded in my copy of the file) is displayed a little larger than a postage stamp in the finders preview pane. While I love many of the conviences of the digital music library I find myself longing for the objects that used to represent the songs in my collection. The little thumbnail isn’t cutting it. Album cover art, gatefold albums with their 12 x 24 artwork, lyrics printed on the record sleeves, and the patina of wear and age on album cover or even cassette tape case all helped to locate the music in the 3 dimensional world in a way that is so far missing from my digital library. Covering my hard drive with stickers helps only until I drag and drop the 200 gigs of music from that drive on to the shiney new 500 gig drive. At that point, some of the history of my relationship with that music (written in stickers) is lost. When one has an intimate relationship with a beloved piece of music it is easy to project that affection to all the physical trappings that surround that music. The physicality of the object, be it cassingle or 45, helps to the music in the world and in one’s personal history in a way that doesn’t exist in the digital realm. Not yet, anyway. 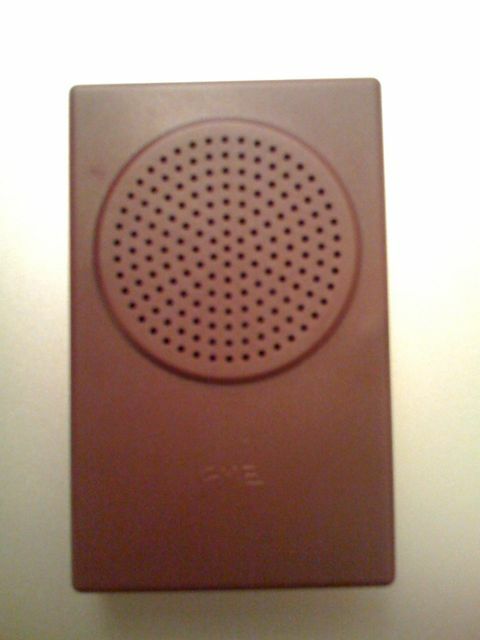 The Buddha Machine is my new talisman. I expect to calm myself with it’s hypnotic drones and melodies while I complete the reorganization of the MP3s, AACs, WMAs and FLACs I call my digital music collection.